When you look at your supply chain with a packaging view, what catches your eye? Do you recognize the number of re-pack moments, the amount of air that is being transported, the unclear labelling, the damages that are caused by inadequate packaging? Just a few examples of the cost saving options that can come to light when doing a detail analysis of the supply chain. These real-life examples confirm that packing and packaging play a substantial part in your supply chain performance. By using Supply Chain Mapping you can map all those aspects. We often see that the importance of packing and packaging management is overlooked and/or not recognized. A missed opportunity. Supply Chain Mapping is a tool for Supply Chain Management. With this method the complete supply chain is mapped; how are value-, information- and good flows running? But also… Where are the most important dependencies with respect to packaging? Packaging can not be seen in isolation. There is frequent contact with packers, transporters, warehouses, customs, law, means of transport, customers, field service engineers and not to forget, other packaging. That is why it is so important to first map your complete supply chain, before looking for improvement. Supply Chain Mapping is used to improve reliability, map waste, put efficiency improvements in place or to achieve faster lead times. The complete chain is mapped: how are value-, information- and good flows running? 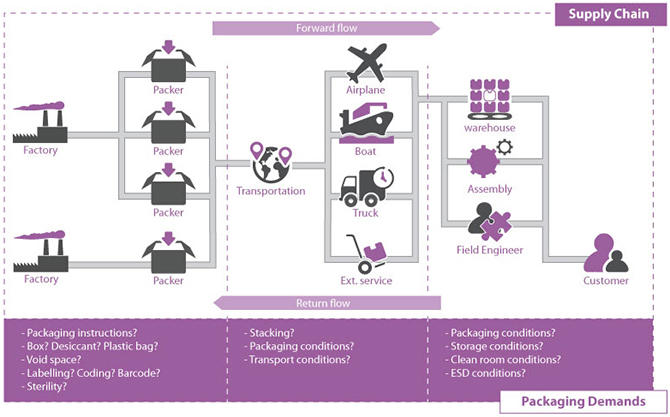 How do we take packaging into account with supply chain mapping? First advice is to involve your packaging specialist in the SCM project. When you don’t have this function in-house, the expertise can also be outsourced. In practice the extra effort and cost will be earned back very quickly. Scope® is our method to map all the packaging aspects in your supply chain in a fast and structured manner. A visualization you can see in the picture above. With the checklist below you can quickly tell if, in the packaging area, there is improvement potential in your supply chain. When the answer is “yes” to 3 or more points from the checklist below, supply chain mapping will most probably bring you an advantage. FPC offers a focus on packaging in the integral supply chain using the Scope® approach. Our specialists bring independent, specific knowledge and experience when you are going through the supply chain mapping process. Improvement points and recommendations are translated into ‘quick wins’ and ‘spot repair’ together with you. Afterwards we will start with structural improvements.